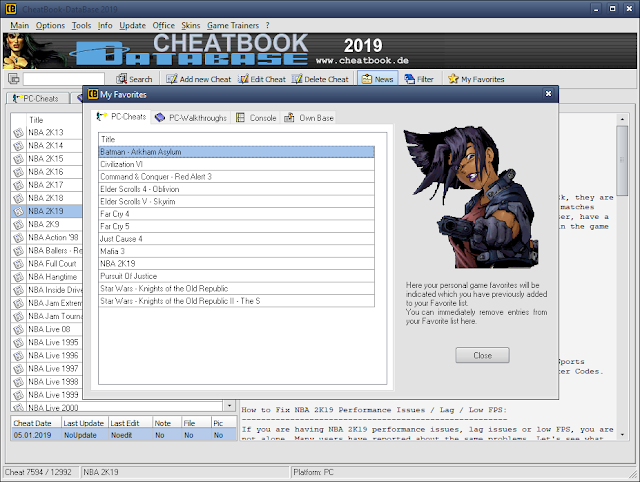 Cheatbook Database 2019 ~ Cheatinfo - The Latest Game Cheats and Codes! Cheatinfo - The Latest Game Cheats and Codes! 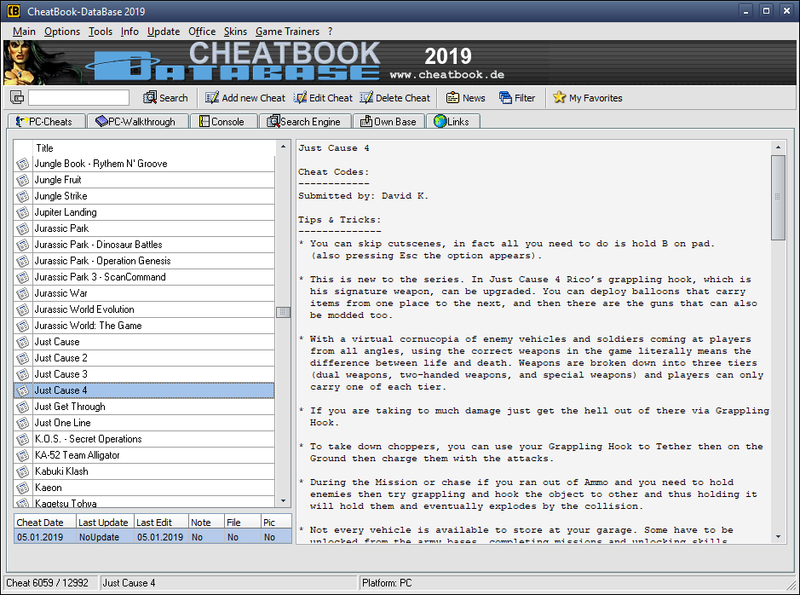 Cheatbook Database 2019 - The encyclopedia of game cheats. A die hard gamer would get pissed if they saw someone using cheats and walkthroughs in games, but you have to agree, sometimes little hint or the "God Mode" becomes necessary to beat a particularly hard part of the game. 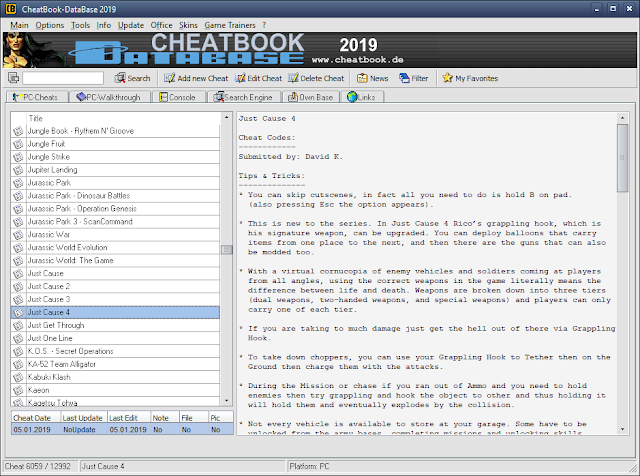 If you're an avid gamer and want a few extra weapons and tools the survive the game, CheatBook DataBase is exactly the resource you would want. - Find even secrets on our page. 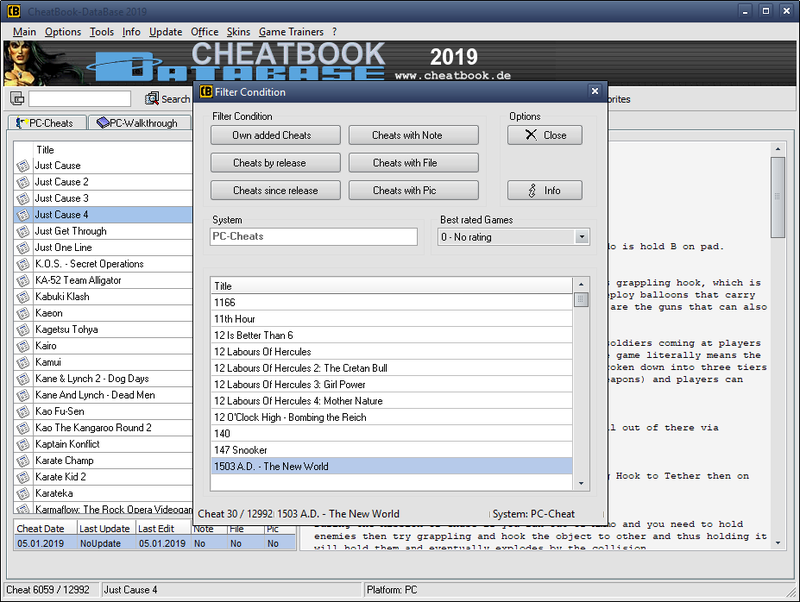 Cheatbook-DataBase 2019 is a cheats code tracker that makes hints, Tricks, Tips and cheats (for PC, Walkthroughs, Playstation, Playstation 2, Playstation 3, Playstation 4, Sega, Nintendo 64, Nintendo DS, DVD, Gameboy Advance, Gameboy Color, N-Gage, Nintendo DS, XBox, XBox 360, XBox One, iPhone, Gamecube, Dreamcast, Super Nintendo, Wii, Wii U, Sony PSP) easily accessible from one central location. If you're an avid gamer and want a few extra weapons or lives to survive until the next level, this freeware cheat database can come to the rescue. Covering more than 24.500 Games Cheats, this database represents all genres and focuses on recent releases. 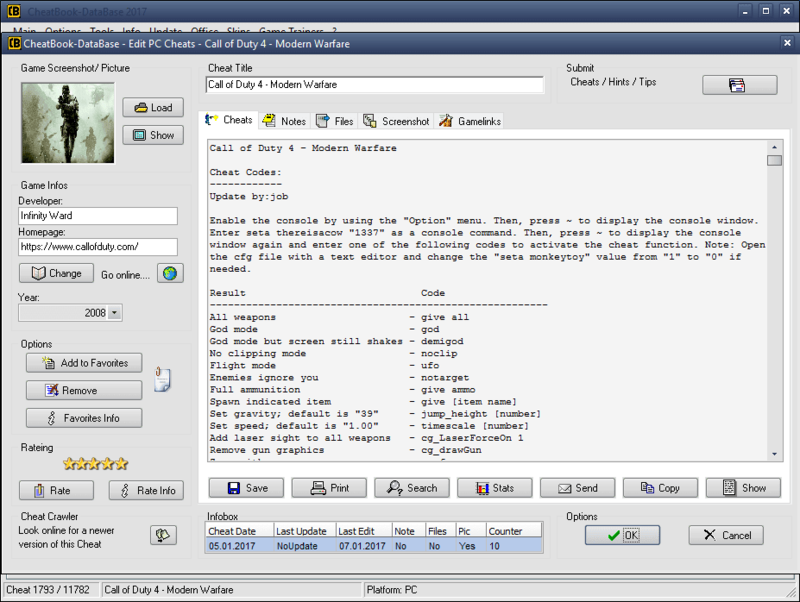 Games are listed alphabetically in the left-hand window. 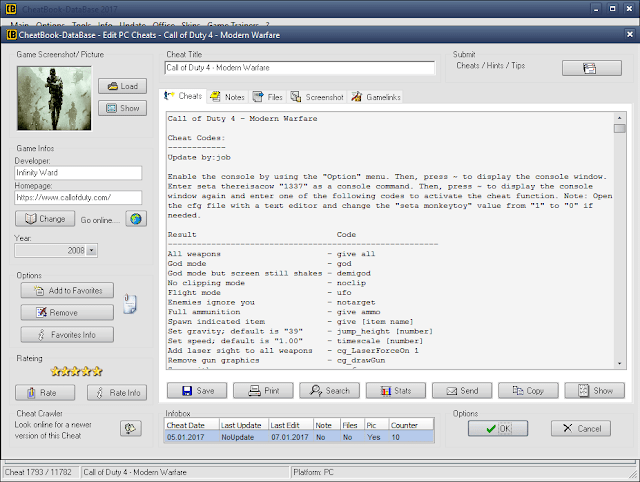 When you click on a game name, the relevant cheat is displayed in a editor window, with convenient buttons that let you print the selection or save any changes you've made. In the latest past many users of the Cheatbook-Database and readers of the monthly being published magazine have sent to us small error messages and suggestions for improvement again and again. First of all we say "Thank you very much!" to all of you! Due to this assistance and the permanent sending in of new and revised cheats the Cheatbook is ever increasing and becoming more and more voluminous. Release date: January 12, 2019. Cheatbook-DataBase 2019 is Freeware for Win95/ 98/ 2000/ NT/ XP/ Vista/ Windows 7/ Windows 8/ Windows 10. Download: New Version Cheatbook Database 2019. Here you can find of a list of the latest PC games we have added to our cheats database. The list is constantly being updated so keep coming back to check for any updates.